The exotic and majestic appearance of the Persian cat captures the attention of cat lovers everywhere, making it one of the most desirable breeds of cats today. Their dense and lush long-haired coat, short legs and broad head with round eyes and flat muzzle faces are distinct physical traits that make them easily identifiable to just about everyone. 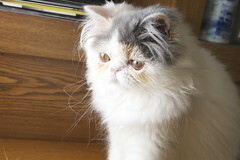 According to the Cat Fanciers’ Association, there are seven main categories of Persians. You can visit their web site for specific information on each group and view pictures. Within these categories, there are many colors and variations.